Where to find Sackets Harbor hotels near an airport? 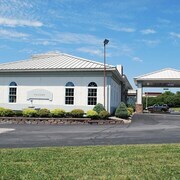 Where can I find hotels in Sackets Harbor that are near tourist attractions? Are you arranging to spend some nights in St. Lawrence Seaway? Hoping to find accommodation in the Sackets Harbor area? Sackets Harbor offers 2 hotels and apartments, all within 0.1 kilometres (0.06 miles) of the town center. 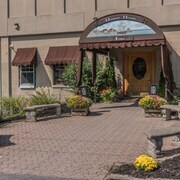 If you are seeking a hotel that is within 3 kilometres (2 miles) from the Sackets Harbor city center, Ontario Place Hotel and Marina Inn & Suites are perfect. 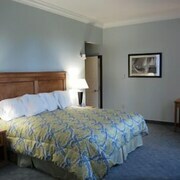 13 kilometres (8 miles) from the middle of Sackets Harbor, is the Hilton Garden Inn Watertown/Thousand Islands. Alternatively, the Holiday Inn Express Hotel & Suites Watertown-Thousand Island can be found 13 kilometres (8 miles) away. 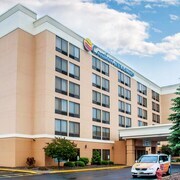 Two other Expedia-listed hotel options worth checking out include the Fairfield Inn & Suites Watertown Thousand Islands and the Hampton Inn Watertown. If you are inspired to see some more of the forests and mountains common in this area, you might also plan some extra days in other places in Adirondack Region. Whether you join in with the common local activities, such as snowboarding, or travel around to explore the area's offerings you will be able to reserve comfortable places to stay in the vicinity. 15 kilometres (10 miles) from Sackets Harbor you will find Watertown, where you can enjoy Jefferson Community College and Salmon Run Mall. 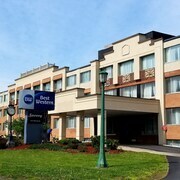 The Comfort Inn & Suites Watertown - 1000 Islands and Best Western Watertown Fort Drum are a few of the fabulous Expedia-listed apartment and hotel options in Watertown. Alternatively, you could stay in Pulaski, 40 kilometres (26 miles) to the south of Sackets Harbor, where you can pick from the Knights Inn Pulaski and Super 8 Pulaski. The Pines Golf Course and Selkirk Shores State Park are a couple of the popular attractions to see in Pulaski. If you are into sports and like to watch local games you could visit Evans Mills Speedway, which is 30 kilometres (17 miles) to the northeast of Sackets Harbor. 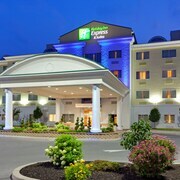 Book accommodation right near the action at the Candlewood Suites Watertown Fort Drum or the Days Inn Evans Mills/Fort Drum. Sackets Harbor features some terrific things to do; learn more by spending a few minutes at Expedia's Sackets Harbor travel guide. What are the most popular Sackets Harbor hotels? Are there hotels in other cities near Sackets Harbor? What other types of accommodations are available in Sackets Harbor? Explore Sackets Harbor with Expedia.ca’s Travel Guides to find the best flights, cars, holiday packages and more!